Wabbit, a photo by Hesterb on Flickr. 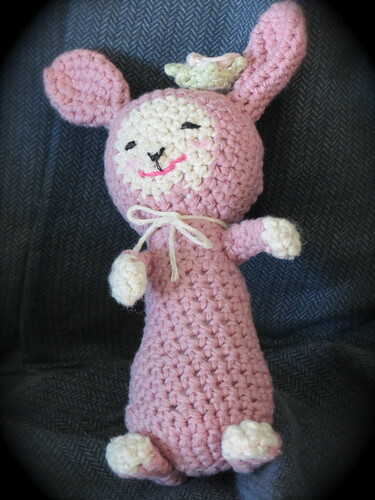 I crocheted this little rabbit for my baby grandaughter (nicknamed Blossom). I made this little crochet rabbit from cotton yarn. She has some bells inside and a detachable lavender scented flower. I was going to make Blossom a calico rabbit with lavender inside it for her bassinet, but I couldn’t find my pattern so I decided to make her this crochet rabbit instead. I like this pattern. It was easy to make and I enjoyed adding my own embellishments. I added hind feet and a pompom tail. The feet are made the same way as the arms but with 7 stitches and are a bit longer. I sewed them firmly to the base of the body and now the rabbit can stand on its own. I made a crochet rose that attaches with velcro. This has a few drops of lavender oil underneath it, as a sleep aid. I really like how the rabbit has turned out. I hope Blossom likes it too. Postscript: As soon as Blossom began grasping I sewed the rose onto Wabbit securely, so that it was not a choking hazard.